Many people want to be cared for in their own home. This is where they feel safe and comfortable, and can spend precious time with their loved ones. The Hospice at Home team support this choice and work 365 days a year to care for patients in their own home. The Hospice at Home team work closely with your doctor and community nurses. How can I access Hospice at Home support? Referrals are made through your doctor, community nurses and other healthcare professionals involved in your care. Once a referral has been received, a nurse will visit you and your family to discuss what your needs are to remain at home. Your care will then be tailored to your specific needs. The amount of care that you receive may increase or decrease depending on how your needs change. 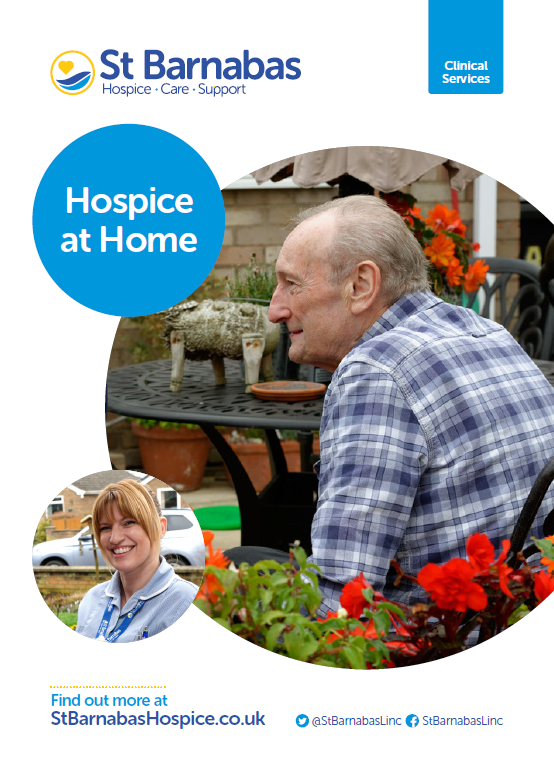 For more information about Hospice at Home services in your area call 0300 020 0694. To download our patient information on the Hospice at Home service simply click the image below or here. The hospice at home team were a wonderful team of caring, thoughtful and professional nurses who helped me and my sister care for my mum in her final days. Mum always wanted to stay at home in her final days and thanks to the nurses she got that wish. Thank you all so much.